The Glovemaker’s Daughter begins in Good Hope Township, Pennsylvania, 2014. After seeing a ghost in a three-hundred-year-old Meeting House (Quaker Church), Sam finds a notebook hidden in the walls. He connects with Rachel Moorside, a descendant of the person who wrote the ledger, in order to find out more about the Meeting House and the people who built it. Through mainly journal entries from the 17th century ledger, we are told the story of a young woman named Rejoice (Joy) who embarks on an epic journey from England to the New World. Fleming creates incredible characters filled with personality, description, and emotions that they feel like real people that I actually know. I found Joy to be annoying, but I appreciated that she always learned from her mistakes, and I admire her perseverance. Joy’s story grabbed me from the very beginning. I love Fleming’s writing style and definitely want to read more by her. Some readers have described this as a mystery, but it doesn’t feel like one. The present day part of the book doesn’t really serve a purpose to the plot. I think if there had been more from Rachel and Sam’s perspectives it could have been more exciting. The ending feels incredibly rushed as well. 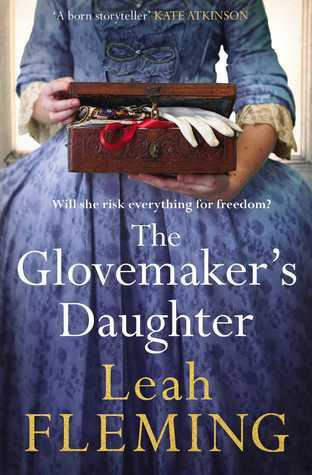 The Glovemaker’s Daughter is a slow-burn historical tale about a young girl’s epic journey discovering family secrets, peace, and love. I recommend this one to readers sixteen-years-old+ who enjoy slow-paced stories filled with tons of description and history.